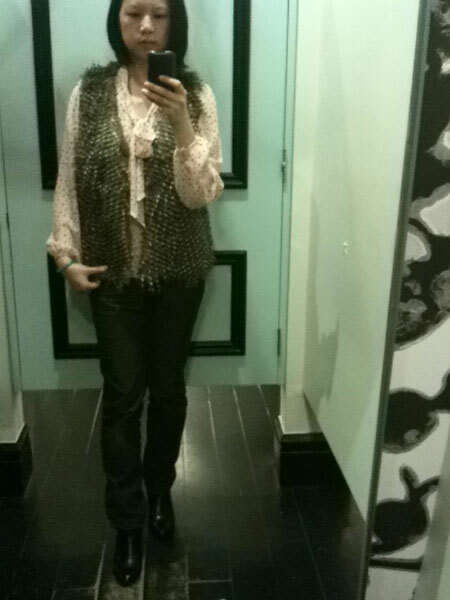 While out and about, I stopped by Forever21 to check to see if there are any great finds. There is no H&M yet in Houston so we Houstonians make do with Forever21. 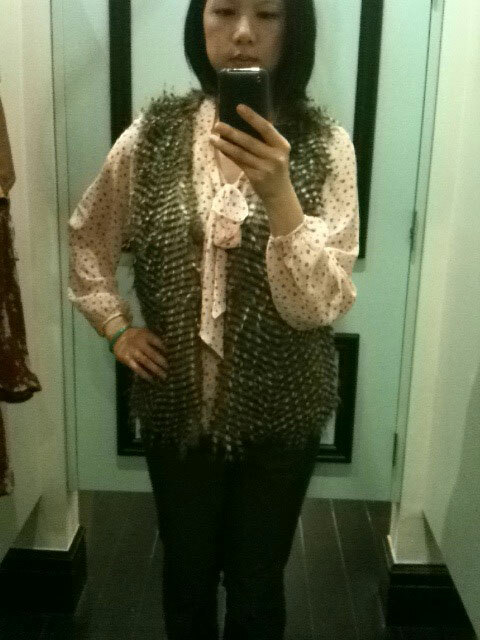 I remember while living in New Orleans, Forever21 was known as great deals, and great clothes. Most people in New Orleans rarely even hear about H&M. I like the fur vest but like most fur vests, it makes me look bulky. I wore a chiffon blouse with a tie neck bow. The print is polka dots! I do like the contrast the fur vest and the polka print. It compliments each other in a weird and amazing way! 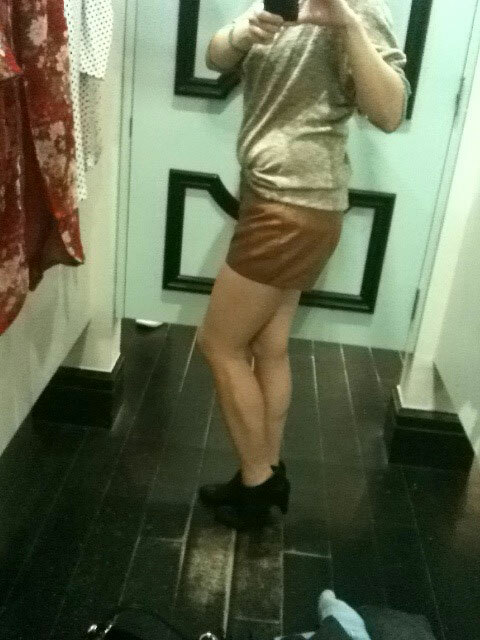 Next I tried on these faux leather shorts. These are tie ups instead of a zippered front. It looks more rustic that way I guess. The leather is very soft and not scratchy at all. 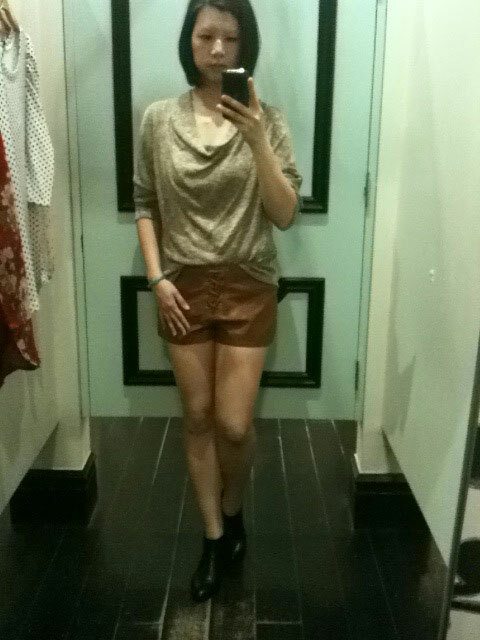 I am not a leather or faux leather person so I didn’t know what to expect when trying on this pair of shorts. 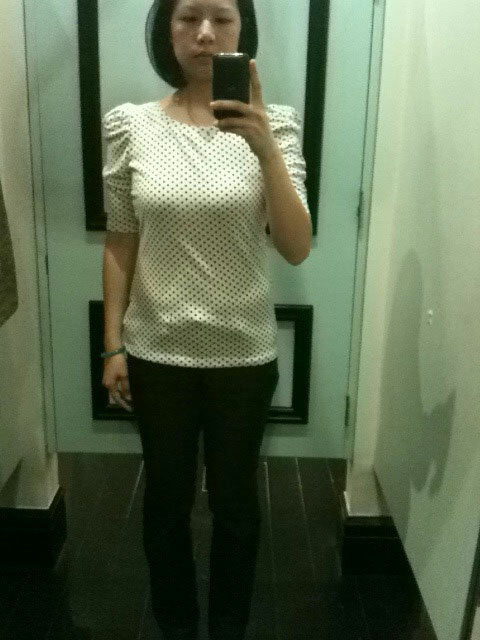 Ah, here are more polka dots. The shirt is so comfy, slim fitting, and has beautiful ruching sleeves. 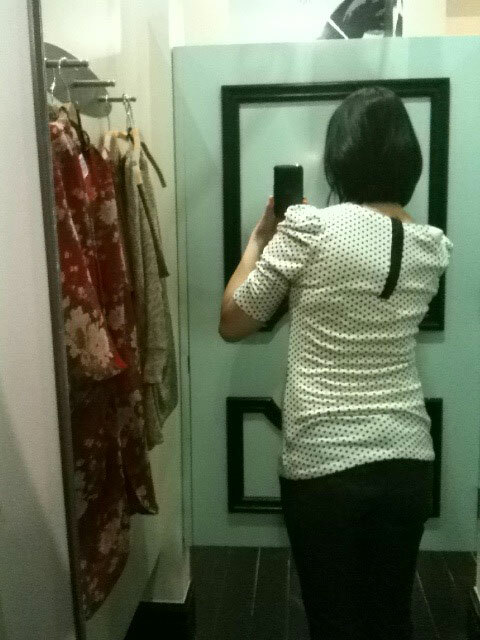 It does have a zipper in the back that I think gives the shirt a not typical look from the backside. So this shirt is a keeper. I am still looking for a leather skirt, leather jacket and maybe a leather pair of shorts. Did anyone find anything good lately? Ummm I love the look of the fur vest and bow-tie blouson! Very Alexa Chung 🙂 I know how hard it is to find a flattering furry vest, though — I’m still in the market for one because they always seem to bulk up on me. Hopefully I’ll find one when I hit the outlets this weekend. The ruched polka dot top is definitely a winner – the contrast zipper is a great touch too. Keep checking back at F21 for a leatherette skirt and shorts–they change their inventory often and I’ve scored some great leatherette stuff there in recent seasons. As for my own glorious finds? I cleaned up at Shop Bop last week and bought that crazy chiffon fringed coat (it’s so fun in person and I’ll be wearing it as a dress). Also I found the perfect puffer coat at J. Crew in a vibrant yellow hue – it’s warm and soft and extremely cheap ($69.00 less another 30%). And, after I went through my closet and realized that all my suits are too big, I ordered a fabulous one from J. Crew in gray pinstripe wool. Seriously, that winter sale is just too good to miss!